Bravo’s Top Chef crew was all over Beantown for season 12, and it looks like besides Tom Colicchio, Padma Lakshmi, Gail Simmons, and Hugh Acheson, Top Chef All Stars champ and noted Fancy Feast connoisseur Richard Blais will join as a recurring judge for the 16 contestants. Expect Fenway Park and Cheers bar cameos, plus guest appearances from actress Emmy Rossum, Jacques Pépin, and Barbara Lynch. The season premieres October 15. Two New Yorkers made the cut; the full release, straight ahead. NEW YORK, NY — August 20, 2014 — Bravo Media’s Emmy and James Beard Award-winning series “Top Chef” will premiere its 12th season in Boston on Wednesday, October 15th at 10PM ET/PT. Returning to the judges table for the new season in New England are head judge Tom Colicchio, judges Gail Simmons, Hugh Acheson and host Padma Lakshmi. For the first time ever, a “Top Chef” winner is joining the judging panel. Richard Blais will make his debut as a recurring judge offering the chef’testants guidance from a chef and a former competitor’s point of view. For a sneak peak at season 12, visit http://www.bravotv.com/top-chef/season-12/videos/top-chef-goes-to-boston. 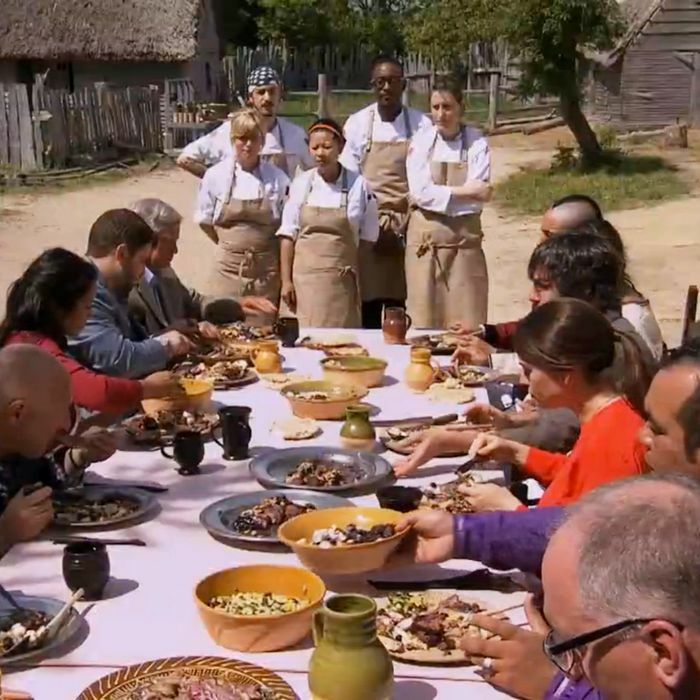 This season features some of the franchise’s “hungriest” chefs battling it out against the backdrop of Bean Town’s flourishing culinary scene. The chefs will go knife-to-knife at iconic Boston locales including Fenway Park, Plimoth Plantation and The Bull and Finch Pub, which served as the inspiration for Cheers and where exterior shots for the show were filmed. Mirroring Boston’s own rich history, Season 12 is full of firsts, including the first meal ever served on the field underneath the Green Monster, a challenge using only ingredients that would have been on hand at the first Thanksgiving meal, the first “Top Chef” food festival and the first fan appreciation challenge where fans of the show were invited to dine inside the “Top Chef” kitchen. The show will also feature a challenge highlighting Boston’s finest from the police and fire departments. Adding to the firsts for the series, the stakes are higher than ever as “Top Chef” introduces sudden death Quickfire challenges that will occur without warning throughout the season and a revamped judges table that puts every chef on the spot. The chefs will be tasked with serving up food for top entertainers, culinary stars and celebrity guest judges including: actress Emmy Rossum, Rob “Gronk” Gronkowski of the New England Patriots, MLB Hall of Famer Dennis Eckersley, actor George Wendt (Norm from “Cheers”), “Watch What Happens Live” host Andy Cohen, Todd English, Barbara Lynch, Jasper White, Ming Tsai, Jacques Pepin, Ken Oringer and Jamie Bissonette. - George Pagonis, 31 — Washington, D.C.
*For more information on the chef’testants, please visit Bravotv.com/top-chef.